So, you just have to make sure that you get the six cities right that was super easy. 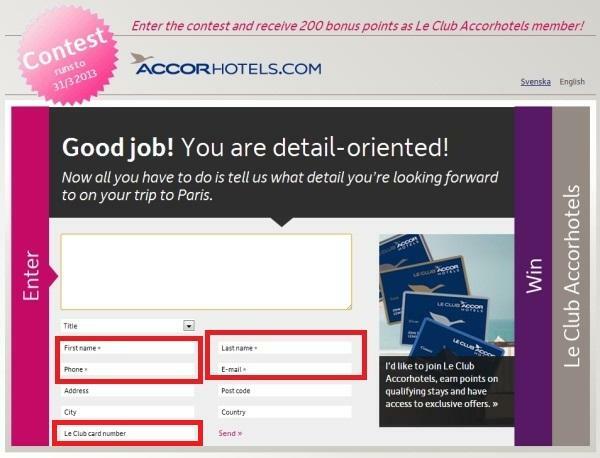 Then you are prompted to fill your Le Club Accorhotels number, phone number, first and last name, and your Le Club Accorhotels number for the 200 points. 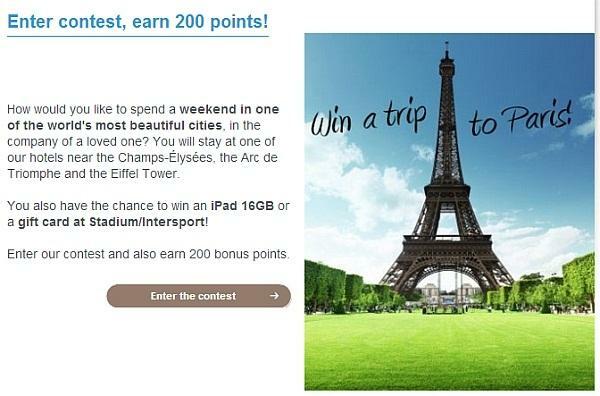 This should be very easy way to get 200 free Le Club Accorhotels points. Will work for sure for those that has their account address is Sweden, Denmark, Norway, and Finland. Likely will work for others as well. By entering the contest, you agree to abide by the following rules: Contestants must be 18 or over, resident in Sweden, Denmark, Norway or Finland, and must accept the contest rules. 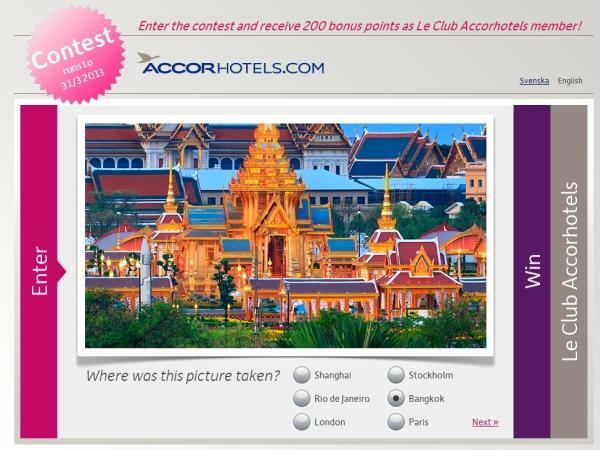 Employees and family members of employees of Accor AHS, our partner hotels and Spirit Kommunikation i Stockholm AB are not eligible to enter the contest. The contest runs from 28 January until 31 March 2013. Winners will be notified no later than 10 April 2013 by phone or email. 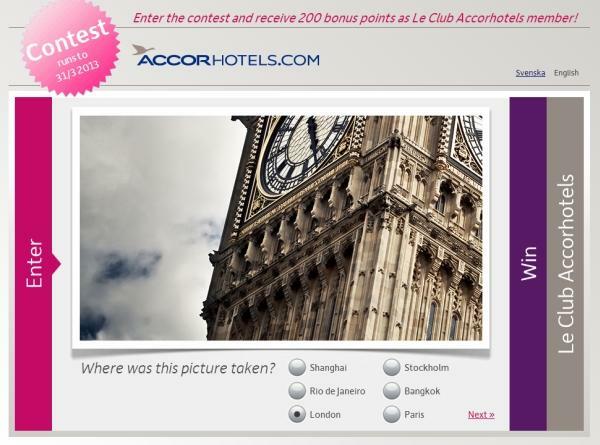 Accor reserves the right to publish the winners’ names on its website. Winners will be chosen by a jury comprising representatives of Accor: Jan Birkelund, Director of Sales; Maria Björkman, E-commerce Executive; and Madeleine Sandström, Le Club Marketing Executive. The jury’s decision is final, and the jury is not required to give reasons for its decision. The value of the first prize is approximately EUR 1,700/SEK 14,000. The second, third, fourth and fifth prizes each have a value of approximately EUR 530/SEK 4,600. The sixth, seventh, eighth, ninth and tenth prizes each have a value of EUR 60/SEK 500. No cash alternatives. Any taxes on winnings are payable by the winner. Prizes are non-transferable. The personal and contact information provided at the time of entry will be used to administer the contest and to distribute newsletters. Recipients may unsubscribe from the newsletter at any time by contacting the sender. By accepting these contest rules, you agree that your personal data may be used in this way. Accor will not be held liable for any technical difficulties or problems that may affect your entry or the final result. 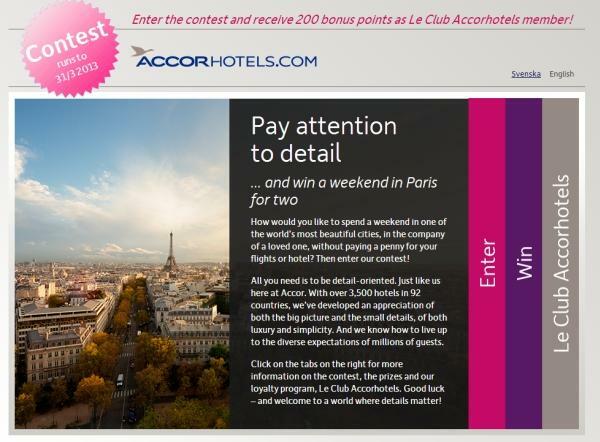 If Accor AHS is not informed of the address to which the prize should be sent within 14 days of announcing the winner, the prize will be forfeited without compensation. Prizes will be sent within two weeks of address confirmation. The weekend trip to Paris must take place during 2013. 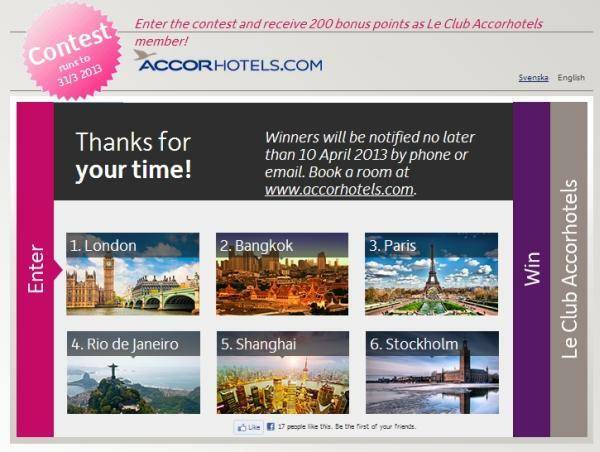 Members of Le Club Accorhotels loyalty, Accor Favorite Guest Business and la carte ibis members, regardless of their status, can earn 200 bonus points by completing the contest, answering the questions and submitting the form, valid from 28-01-2013 to 31-03-2013. Members must provide their loyalty card number or member number, a motivation letter, first and last name and e-mail to receive 200 bonus points. As member you can only benefit from this offer once. Your points will be credited on your account within 30 days after your participation in the contest.